It looks like Skavenger will be releasing a U.S.A made version of Vinnie Sammon’s signature Tunnel frame in the next month or so. This frame made by the guys at FBM features straight gauge tubing, a 74.5-degree head tube angle, 71-degree seat tube, 8.75″ standover height, 11.75″ bottom bracket height and a 13.5″ – 14″ chainstay length. The Tunnel frame also features a gusset on the down tube, a wishbone chainstay, a mid bottom bracket and removable brake mounts. 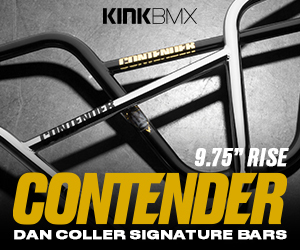 This frame will be available in 20.75″ or 21″ with colors of raw and ED black and a weight of 5 lbs 1.8 oz. (20.75). Animal Bikes came across some old footage Chad Shackelford had of Vinnie Sammon from 2002. Clips from a time when bars were 25 inches wide, 6.5″ tall and bikes weighed nearly twice what they do now. Good times. Vinnie Sammon has been busy uploading ore sections from the Skavenger DVD. Hit his Youtube page to see more sections from the DVD if you haven’t seen it in full yet or want to watch individual parts. Head over to the Animal site to check out Vinnie Sammon’s dialed setup. Here’s Vinnie Sammon’s section from Animal‘s “Cuts”. Enjoy!